Forest Thompson lifts his 15-year-old son into a whirlpool. The boy can no longer speak. He can barely move. This is the last time Forest will ever hold him. Silence — and memories — fill the room. That boy, he’s slipping away. The family comedian, Charles enjoyed quoting Tyler Perry, playing practical jokes and dancing. And, like so many teens, Charles loved Beyonce. His biological father, imprisoned for life, asked Forest and Tremica to raise him. The patriarch of the family, he resembles Atlas: strong, resilient, trying to carry family on his shoulders through the defining moment of losing Charles. Since his son’s death, he has started his own business to allow more time with family. The youngest in the family, Ariel doesn’t talk about her brother’s condition. She provides a note of levity, carrying a camera around George Mark and ordering people to smile. She hopes to become a photographer one day. Forest and Tremica Thompson brought their son and his siblings to George Mark Children’s House, a pediatric palliative care and hospice center just outside Oakland, when caring for Charles at home became too daunting. The place is beautiful, set amid plush gardens, high on a hill. No family wants to make the journey. Yet those who do discover their own resilience. It’s Tuesday, January 11, 2011, their 16th day here. Charles hoped to become a child psychologist. He wanted to help troubled kids. He knew what that life was like. Charles fell into the family’s arms in November 2007. Tremica’s cousin, Charles’ biological father, had been imprisoned for illegal possession of a firearm, his third felony conviction in California. That made Ray Charles Daniel a lifer. “Will you take care of my son?” he asked. Charles was 13, in foster care with the state. His father was in prison; his mother had abandoned him. He’d never known stability, never had a childhood. Forest and Tremica’s goal was simple: to let him be a boy. The hydrotherapy room grows dark as the sun drops behind the horizon. The whirlpool lights up with an array of colors: purple, yellow, green. As he floats in his father’s arms, Charles’ breathing slows to a hush. A child’s life grows in water in the womb, and now, Dad is helping midwife his son into the next transition. It’s a way of holding on while letting go. Two days earlier, Forest shuffled down the hall of George Mark Children’s House. At 6 feet, 240 pounds, Forest resembles Atlas, the weight of the world on his shoulders. Today, everything is bearing down. It’s like that when your son is dying. Questions clutter Forest’s mind: Is there really nothing left to help my son? Is he in pain? What will it be like at the dinner table with an empty seat? Am I communicating enough with my other children? Forest, 39, rounds the corner into Charles’ room. The boy holds up his left hand for his dad. The two lock hands. Charles smiles. And for a brief moment, so does Dad. Volunteer George Warren wheels a patient through George Mark. Doctors and nurses traditionally have been slow to address the possibility of patients’ deaths, especially when those patients are children. But in the past decade, that paradigm has shifted. In the early 2000s, only a handful of hospitals had palliative-care programs aimed at maintaining quality of life for the terminally ill. Today, more than 80% of hospitals have palliative-care programs, says Thomas Smith, director of palliative care at Johns Hopkins medical institutions in Baltimore. The shift, he says, is a result of the medical profession listening to patients. The fear of dying is the “existential threat that runs through every conversation and every thought” a patient has upon diagnosis. “We are getting to the point as a nation where we can have some of these tough discussions,” he says. Facilities like George Mark Children’s House are rare in America. In fact, there are only three such facilities dedicated solely to children, because insurance companies until recently have been unwilling to reimburse the benefit. In a culture where accepting the inevitable death of a child remains taboo, Forest and Tremica talk openly about their journey, providing a rare glimpse into how parents hold their family together during such a defining moment. “When you hear a word like ‘cancer,’ the first thing a parent thinks about is: Is my child going to die?” says Nancy Hutton, medical director of Johns Hopkins University’s pediatric palliative care program in Baltimore. Trained to focus on sustaining life, doctors and nurses traditionally have been slow to address the possibility of death, especially when their patients are young. But in the past decade, that paradigm has shifted, Hutton says. Health professionals are encouraged to talk about end-of-life care when cancer is first diagnosed. George Mark Children’s House is a rarity in the United States: a place solely for children and their families to come during such a traumatic time. Largely supported by private donations, the facility allows families to stay for free. Volunteers cook meals. A tutor helps patients’ siblings keep up with missed schoolwork. A team of supporters — a social worker, a psychologist, a child-life specialist, a chaplain, doctors and nurses — meets with the family regularly to offer guidance. Pets are allowed, too. Anything to provide normalcy at a time when nothing is normal. 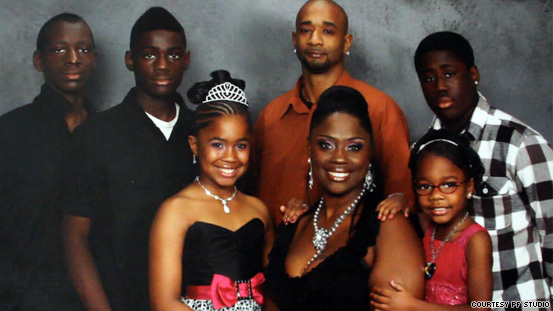 Charles’ parents decided to include his siblings — Nate, 19; Trayshaun, 17; Shaunee, 12; and Ariel, 6 — in the dying process. They wanted their children to learn that death is not to be feared, that families stick together in times of crises and, most of all, that Charles, whom they legally adopted in 2010 as he fought his brain tumor, needs each of them as death approaches. Nate is the family’s athlete, pensive and quiet; Trayshaun is the Hollywood-handsome dancer, outgoing and personable; Shaunee is the promising singer with a sensitive streak; and young Ariel is the budding academic. During this week in January 2011, the family will lose its comedian. By sharing their experience, Forest and Tremica hope to help someone else with a dying child. Trayshaun runs his fingers through Charles’ hair. He styles the curls straight up in the air. His brother stares back at him, his deep brown eyes transfixed. “Quit the mohawking,” Dad says. Charles glances across his room, almost in slow motion, taking in everyone who surrounds him. Trayshaun pokes his brother’s nose. Charles fends him off with his left hand, the only limb he can move. “Blink once if you want me to punch Trayshaun in the face,” Dad says. Charles blinks. The room erupts with laughter. Around Charles’ wrist is a rosary. His brothers bought it for him after a child died in a neighboring room. Though Charles has lost most of his mobility, he finds a way to shift the rosary so he can clutch the cross between his thumb and index finger. His brothers wear rosaries around their necks. They have kept vigil in Charles’ room ever since the family arrived on December 27, 2010, from their home in Stockton, 60 miles away. One sleeps on the floor, the other in a nearby bed. If Trayshaun leaves the room, Nate stays behind. They want Charles to know his brothers have his back, always. 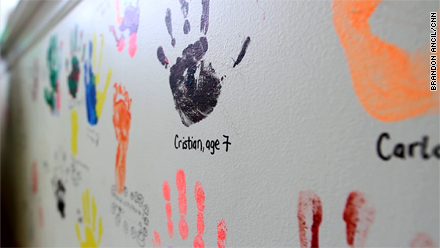 Handprints of former patients and family members at the George Mark house decorate an activity room wall. George Mark Children's House became the first children's hospice in the nation when it opened in 2004 in San Leandro, California. 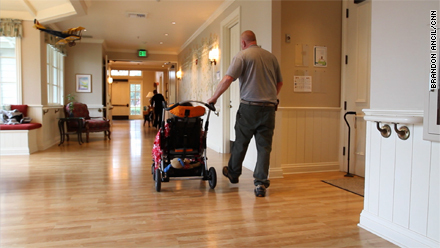 The facility, however, provides more than end-of-life care. The staff helps children who have debilitating diseases and critically ill conditions undergo therapy in a comforting environment. Pediatric palliative care, as the field is known, aims to provide children and their families with a better quality of life by providing support during extremely stressful and difficult times. George Mark is the brainchild of two doctors: a child oncologist and a psychologist. She became a psychologist to help families navigate grief. George Mark is a nonprofit organization. Private individual donors have traditionally been its biggest supporters, along with some corporate donations. With the struggling economy, donations have shrunk. Insurance companies initially were slow to pay because there was no protocol in the United States for such treatment. But Beach and Hull say insurance companies have gotten better in recent years at reimbursing costs. Families, even those with no health insurance, stay for free. When they first came to the hospice, the brothers wheeled Charles to a playroom, the cafeteria and the gardens outside. Now that he has lost his ability to speak and eat, the days are passed mostly in his room. But their playfulness with their brother, that has not changed. When Charles was diagnosed with brain cancer, Trayshaun and Nate shaved their heads as a show of support. “Y’all are crazy,” Charles told them. “He knows he’s not going to pass alone,” Trayshaun says now. Their camaraderie wasn’t always like this. When Charles first came to live with them, friction formed before the bonds of brotherhood. Charles’ girlfriends were an issue, too. He’d bring them over to hang out at the house, but “every time, they’d end up liking me,” Trayshaun says with a grin. Over time, friendship replaced jealousy. The two shared a room and stayed up late chatting about shared interests: girls and dancing. Mom and Dad watched them grow so close, they were like twins separated at birth. After Charles’ diagnosis, when darkness consumed the boys’ room late at night, Charles confided that he was scared of dying. Trayshaun comforted him, in his keep-it-light way. “I’ll catch you on the flip side,” he told Charles. Sometimes, Nate plays a video on the television in Charles’ room. It shows Charles beaming in the backseat of the car while their dad speeds down the highway. Charles sings “Bleeding Love” by Leona Lewis. The video was shot on a trip to Los Angeles. Charles had been invited on a Make-A-Wish-Foundation vacation to see Beyonce — his crush — in concert in Arizona. But Charles traded the chance to meet the singer for a family vacation to Los Angeles. They shopped in Hollywood, dined on soul food at Aunt Kizzy’s, played at Universal Studios and ran around Venice Beach. There were no hospital stays, no chemotherapy. Everyone was just able to feel free. “It was the best trip,” Nate says simply. Even in this hospice room, memories from that trip bring smiles. Mom, Dad, Aunt Janice Mays, Nate and Trayshaun share laughs over how silly Charles was. Trayshaun leans in so close to Charles, it looks as if the boys will kiss. The two hold hands. But as Charles gasps for breath, he lets go of his brother’s hand and reaches for his mother’s. “Ohhh, you wanna go to the old lady’s side,” Trayshaun teases. An audible grunt comes from Charles. “Uh-huh,” he says. “Did you hear him?” Forest says. It’s 10:10 p.m., a long day nears its end. As everyone begins to leave, Charles’ breathing grows louder, more labored. His moans echo through the room and down the hall. Tremica pulls her son close. Charles slipped out of the house and ran. It was June 20, 2008. He’d been living with the family just four months. Forest and Tremica were always saying he was part of their family, that he’d made them whole. Charles had never known such compassion. His feet hit the pavement running. He would put these folks to a test: Will they miss me if I’m gone? Tremica put out an all-points bulletin. She called police. She went to the local bus and train stations. She passed out his photo. Minutes turned into hours. Around midnight, Charles slinked home. Nate and Trayshaun covered for him. They sneaked him upstairs and into bed. The next morning, it was family meeting time. Mom and Dad spoke of being united. “We don’t run away from our problems,” Tremica said. An even greater test would come five months later, in early November 2008, when Charles awoke with a crooked eye. A series of medical tests showed that Charles had a brain tumor. Caring for their son would cost Forest his manufacturing job and Tremica her transportation job. Charles spent much of that time in hospitals. Seizures wracked his body. Radiation made him itch all over. Chemotherapy made him bald. Once, a kid at school pulled off Charles’ knit cap in front of classmates. Trayshaun came to his brother’s rescue, his fists clenched. Charles celebrated his 14th birthday with a limousine ride and life-size poster of Beyonce. At one family gathering, he told everyone he was thankful to be alive. The day after Thanksgiving 2010, the neurologist met with Forest, Tremica and Charles. The cancer had spread. “There’s nothing more we can do,” the doctor said. Tremica’s shoulders shook. Dad cried, too. So did Charles. But just as quickly as he’d absorbed the news, the teen forgot what the doctor said. On the car ride home, Tremica wept more. It was one of those open-the-floodgates, rattle-your-soul cries. Charles Daniel, far left, poses with his family for a portrait. The days crept by. On Christmas Eve, the home buzzed with excitement. Charles and his siblings waited for the clock to strike midnight. As soon as it did, they tore into their gifts. The boy with the brain tumor squealed when he saw one gift: an Xbox 360 Kinect and the interactive video game “Dance Central.” They popped in the disk. But by night’s end, Charles writhed on the floor. Doctors warned that when his seizures intensified, he would decline quickly. “It’s just fun to have him around,” she says. Six-year-old Ariel doesn’t talk about her brother’s condition. Bubbling with energy, she provides a note of levity: She walks around with a camera, ordering everyone to smile before she snaps away. Forest and Tremica sit in the hospice gardens, a white chapel behind them. The couple’s faces, sunken by stress, stretch with smiles when they talk about their son. They hold hands. They finish each other’s sentences. “You live every day hoping that he comes back and is just Charles,” Dad says. “To have him not be able to tell you what’s going on with him — if he’s hurting … ” says Dad. Forest and Tremica believe in second chances, like the one they provided Charles, because both are living proof of that transformative power. Forest was a member of the Bloods, a gang that ruled the crime-ridden streets of Stockton, California, a city that consistently ranks among the top 10 most dangerous in the nation. She prayed daily for her mother to get off drugs, and she eventually got clean. The youth minister paid Tremica’s tuition to attend private school. Without the help, Tremica says, she’d have ended up in state care or foster care. In the gardens behind the couple, a fountain with oval stones rests next to the front door of the chapel. Etched into each rock is the name of a child. Charles will soon have his stone. “We thought we were teaching Charles to be a child, how to just be a kid, how to grow up, how to go through school, achieve certain things in life,” Tremica says. Charles ended up being their teacher. Forest Thompson holds Charles in a hydrotherapy session to calm his son. Forest’s arms wrap around Charles in the hydrotherapy pool. Dad closes his eyes to cherish the moment, to release months of agony held inside. “You’re with me now,” he whispers. He wasn’t there the day Charles was born. But he wants his son to know his father is with him to the end. Charles died three days later, on Friday, January 14, 2011 — 19 days after he entered George Mark. It was supposed to be family picture day. Trayshaun walked down the hall to fetch Charles’ favorite shirt, a tuxedo T-shirt he purchased on a family trip to downtown San Francisco, and returned to the room just in time. Charles took three deep breaths. Mom, Dad and Trayshaun stood at his bedside. A week after his death, more than 50 friends and relatives crowded the chapel for a Celebration of Life service. I won the battle. I am in heaven now. That ole cancer has no way to cause me any more pain or discomfort, nor does it live within me. So, to my family and friends, thank you for being a part of my life and loving me in your own special way. On a television screen, an image of a vibrant Charles appeared. It was the video from the trip to Los Angeles. The family beamed as they listened, one more time, to Charles croon. More than a year after his death, photographs of Charles adorn the house he called home the last three years of his life. The sheets are tucked in tightly on his bed, his favorite stuffed animals sitting where Charles once slept. “I always keep it nice, because that’s exactly the way he would want it,” says Nate. He has moved into the room with Trayshaun and sleeps on a third bed. Forest and Tremica Thompson invited CNN to document the final week of their son’s life to help other families going through similar ordeals. In January 2011, reporter Wayne Drash and digital content producer Brandon Ancil spent six days, around the clock, with the Thompsons at George Mark Children’s House outside Oakland, California. They also interviewed each family member and the founders of the facility. Many nights, Forest awakens with tears in his eyes. Charles performs Madea skits in his dreams. Other times, they’re on vacation in Los Angeles. Charles dances and sings. Tremica keeps Charles’ rosary on display in the master bedroom. When the pain of losing him overcomes her, she holds the cross. “No one should be ashamed to lose a child. It’s not by choice. It’s something that happens, and it shouldn’t be secretive and something nobody talks about. Change comes in many forms, often when one least expects it. The feet of a 2-year-old patter across the floor; her squeals bring smiles to Forest and Tremica. Again, the couple was asked by a relative to raise a child; how could they say no? Forest and Tremica hope to adopt their little girl soon. Already, she’s family, another child with a second chance.